The five tracks making the first CD were originally released as a download-only album, Fervency, on Moodgadget a year ago, and are now complemented by a second CD of previously unreleased material, and published on UK imprint Low Point. Recorded over a period of four years, during which Dunn explored a variety of set ups and sound sources, the twelve pieces making up this double album occupy a common atmospheric space, somewhere between stylised drone exploration and the outer reaches of processed modern classical. While Dunn’s soundscapes appear pretty static, they are far more expressive than simple drones and have a much wider emotional scope. The compositions vary greatly in length throughout, ranging from the short and sweet Last Minute Jest, clocking at just over two minutes, to the sprawling seventeen and a half minute album opener Butel, greatly impacting on the level and extent of the processing applied for each composition. The shorter pieces (Last Minute Jest, Small Show Of Hands or Sets Of Four (Its Meaning Is Deeper Than Its Title Implies)) often offer just a glimpse of the cinematic landscapes that unfold on There Is No End To Your Beauty, Grab (And Its Lost Legacies), or Bonaventure’s Finest Hour for instance, but they somehow help balance out the record overall. Dunn also plays on the hue of his pieces to give them a distinctive character. There is a sense of uniformity running through this record, yet he alternates between rather muffled sound spaces, in parts of Butel, There Is No End To Your Beauty or The Second Pandora for instance, and more opened and vibrant moments, most prominently on Empty Gazing and the wonderfully airy Promenade. Behind the apparent stillness of the music and the monotony of soundscapes caught in dense fog lies a refinement which gives this record a particular resonance. Indeed, if the original sound sources are, at best, barely discernable, Dunn’s heavy processing still occasionally leaves off a thin film of reality, more often than not in the higher register. This is particularly true with guitar and piano textures, which percolate through at irregular intervals throughout the record. This is especially true on the superb piano-led Sets Of Four and on closing piece The Nihtjar, built from guitar chords which are, for the majority of the piece, stretched and ground down into tiny particles, to rather stunning effect, but appear almost brought back to their original state toward the end. It is perhaps not a coincidence that this corresponds with the apparition of the first clearly recognisable human voice of the record, as if Dunn was easing his audience back into reality. 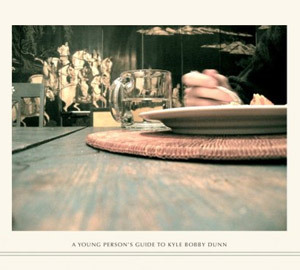 On paper, A Young Person’s Guide can sound a tad daunting, yet Kyle Bobby Dunn’s beautiful and fluid compositions are for the most part totally absorbing. The soundscapes, although very minimal, appear rich in tones and textures, and continuously evolve, rather than drastically change, through the whole record, making it a totally fascinating work from beginning to end.